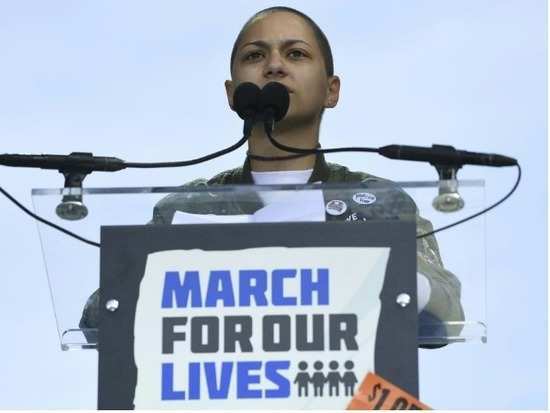 A high school senior, Emma has become an outspoken activist for gun control since the February 14 shooting at Marjory Stoneman Douglas High School. The March For Our Lives movement arose after 17 deaths in a school shooting in Parkland, Florida, last month. And student leader and Parkland survivor, Emma Gonzalez gave a powerful speech at the main Washington DC event. Huge gun control rallies swept the streets of America and it was a sight to behold. After listing the names of the victims, Emma stayed silent on stage for six minutes, 20 seconds - the time it took for them to be killed. More than 800 sister protests were planned nationwide and abroad, with solidarity events taking place in Edinburgh, London, Geneva, Sydney and Tokyo. González has delivered powerful speeches on gun control since the shooting, most notably her now-famous "We Call B.S." speech from a February 17 rally in Fort Lauderdale, Florida. When she finally broke her silence—after six minutes and twenty seconds on stage—she explained that it exactly mirrored the amount of time it took for the Parkland shooter to take so many lives and change her community forever. The speech was a reminder of the teenage activist's power and determination and it was all things empowering and heartening. Singers Ariana Grande, Miley Cyrus and Lin-Manuel Miranda, the man behind hit musical Hamilton, performed on a stage erected in front of the US Capitol building. The music was interspersed with speeches from impassioned youth leaders. Although the turnout during Saturday's marches has been huge, the issue still divides Americans. The right to bear arms is protected under the second amendment of the US constitution and the National Rifle Association (NRA) gun lobby remains highly influential. None the less, we salute all those who joined the March For Our Lives.